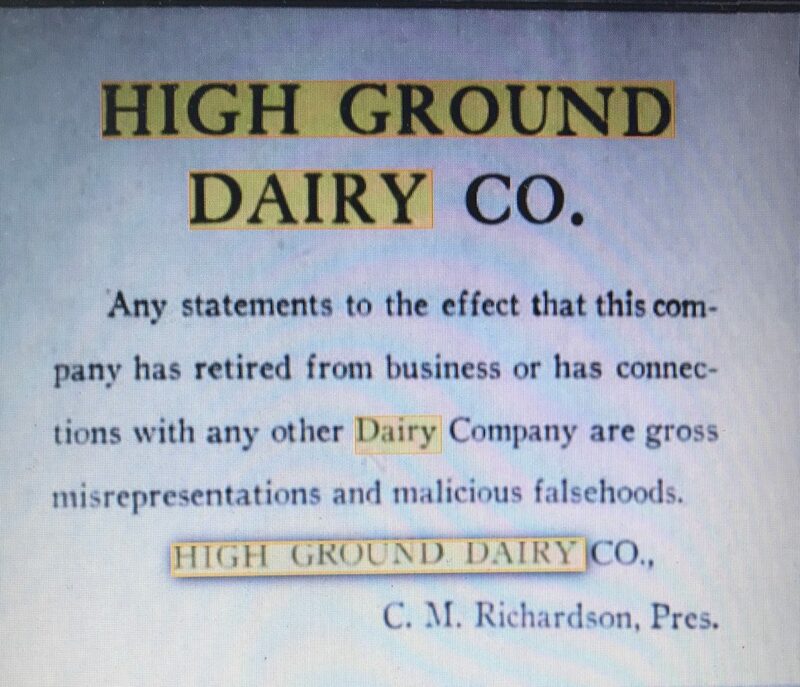 High-Ground Dairy Co., Brooklyn, N.Y. 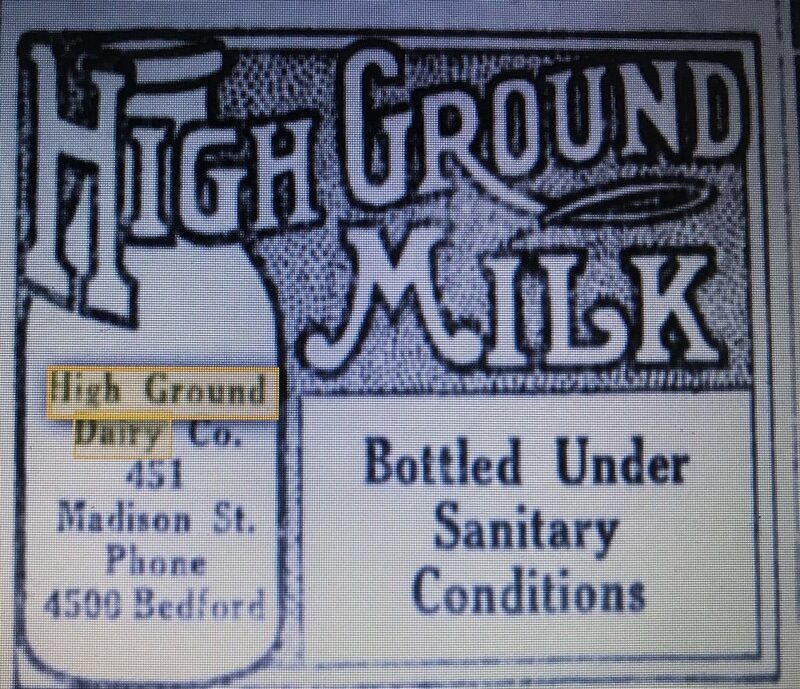 The High-Ground Dairy Co. was in business from 1902 to the early 1920’s, always using 443 – 453 Madison Street as their primary address. 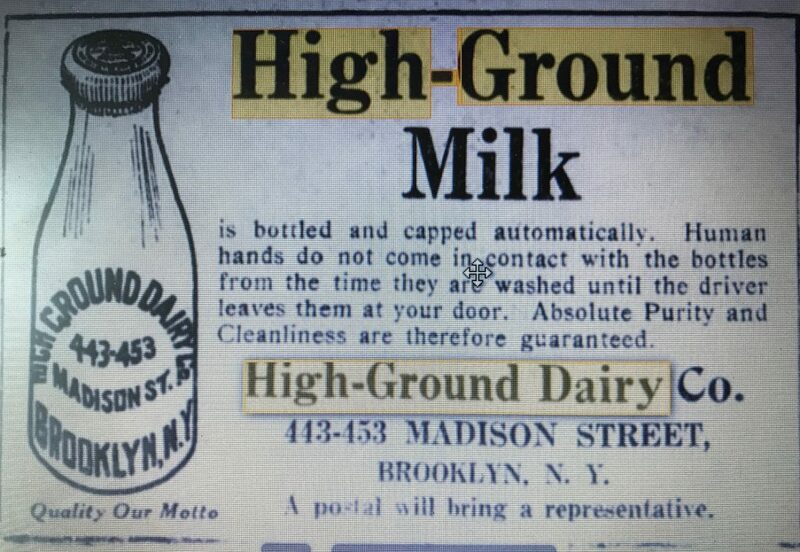 Articles incorporating the High-Ground Dairy Co. of Brooklyn have been filed with the Secretary of State. The capital stock is placed at $50,000. And the directors for the first year are: Frederick H Herkstrater, Charles Flugge and Henry W Herkstrater. Later, the business is listed in the 1913-1914 and 1922 Copartnership and Corporation Directories of Brooklyn and Queens. C M Richardson and Charles Cooke respectively are listed as President. In addition to the Madison Street location the business also had several branch stores throughout Brooklyn. I’ve seen them list 219 York Street and 325 Centre Street in newspaper articles and advertisements. The company also owned at least one creamery in Broome County, New York – the Center Lisle High-Ground and one creamery in rural Pennsylvania; the Hop Bottom Creamery. In 1911 they apparently had some identity issues. A January 24, 1911 notice published in the Brooklyn Daily Eagle stressed that the company was still in business. The 1922 Directory contains the last listing that I can find for the business and I can find no advertisements for them after that year. It’s possible that the milk delivery strike in November of 1921 hurt the business beyond repair but I can’t prove it. 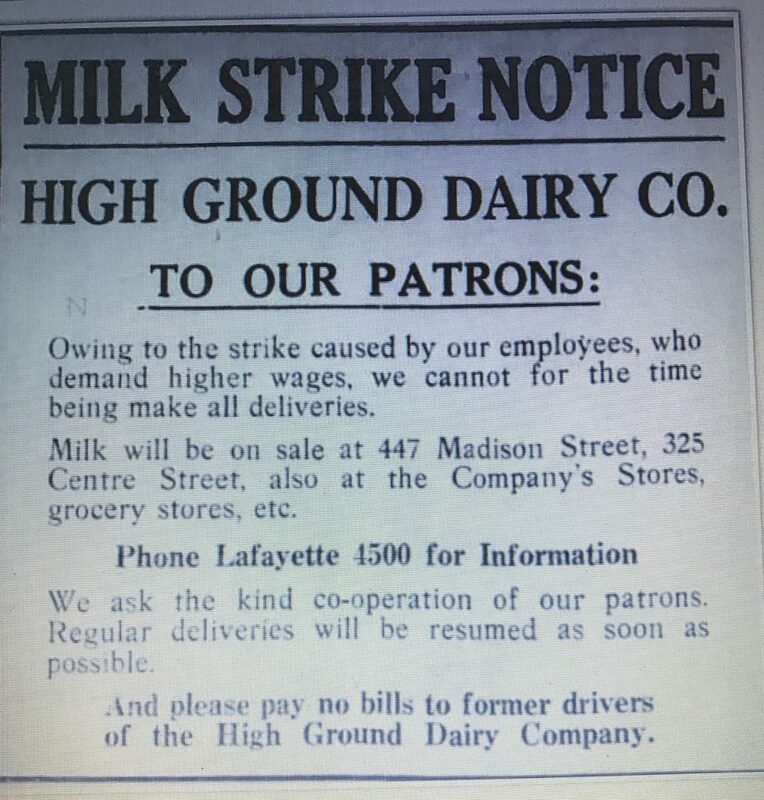 During the strike they ran a notice in the Brooklyn Daily Eagle telling their customers where they could obtain milk. I found one machine made quart bottle with significant Manganese Dioxide purpling. It fits with a teen’s manufacture date. 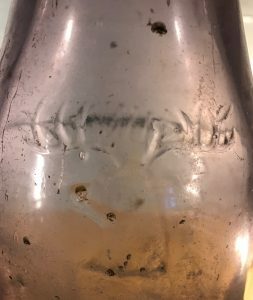 The head of a deer or elk is embossed on the back of the bottle. Next Next post: Corona Bottling Co., 109 – 111 53rd Ave., Corona, L.I., L. Aledort & Son, Props. Telphone: Newton 2399.